While Scott continues to crush the sportsbooks with his winners every week, Jacob’s streak is running in the opposite direction. Afterwards we make plays for Monday Night Football as the Dolphins visit the Jets on this edition of Let’s Bet! 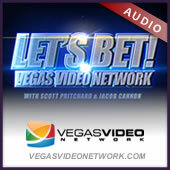 After Scott makes fun of Jacob and his latest streak, we take a look at why the Patriots lost to the Bills, make our week four picks for the Bills vs Bengals game, and answer some great live chat questions on Let’s Bet! After Jacob licks his wounds from his first loss of the season, due to the Patriots high flying offense, Scott goes on to praise Bill Belichick. Then, Scott and Jacob hop on different sides for our week three picks on the Patriots vs Bills game. Let’s Bet! continues to pound the sportsbooks with our winners every week! On this edition we recap our plays from last week, Scott tells us about his love affair (with the Chargers) and we make plays on the Chargers vs Patriots game. Scott expresses his thoughts on calling a football game for a little thing called “lightening” and we gear up for smash mouth NFL action as we make picks on the Steelers vs Ravens game on Let’s Bet!.